The new School of Modeling, Simulation and Training provides students with the latest technology to excel in their career fields. To get one idea of what really happens in Central Florida Research Park, turn into the park. Pass Progress Drive and find two glassy buildings named “Partnership.” On the third floor of Partnership II, meet Randall Shumaker, director of UCF’s new School of Modeling, Simulation and Training. 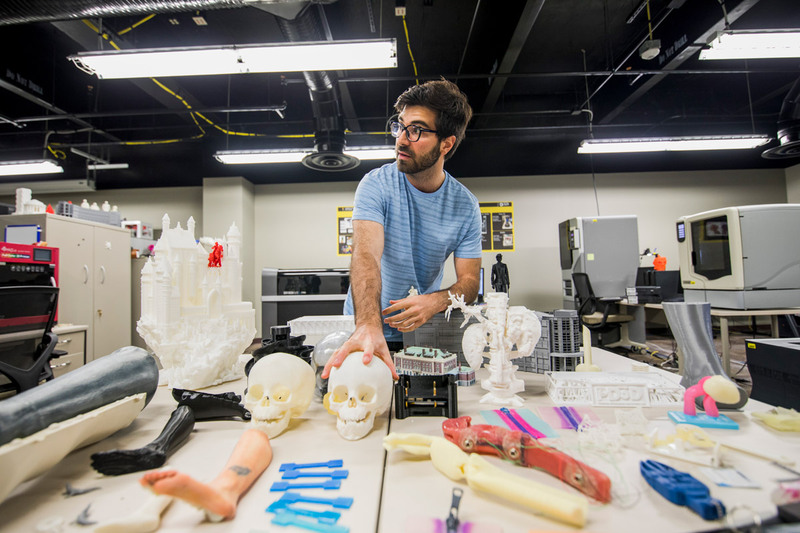 More than 500 master’s and doctoral degrees have been awarded from UCF in the fields of modeling and simulation since 2004, many of them landing graduates into top-level positions with major companies and government agencies. And this year, those graduate programs gained official “school” status through the College of Graduate Studies. There are 150 companies in Research Park — including Boeing, Lockheed Martin, Leidos and Raytheon — as well as government agencies. And SMST works alongside all of them all. This building, along with Partnership III, represents the world epicenter of modeling, simulation and training. More than $6 billion in commerce is generated in this park annually by more than 150 companies, including Boeing, Lockheed Martin, Leidos and Raytheon, as well as government agencies and all branches of the military. And UCF works alongside all of them all. With all of these opportunities for collaboration, there are too many labs to visit in a single afternoon. Here are just a handful of things students can gain while taking classes through the School of Modeling, Simulation and Training, according to Shumaker. Our students create models and develop simulations that are being used in the real world. They’re tools to replicate high-stress, high-consequence situations where quick decision-making is crucial. We say we’re developing high-performing teams in a short amount of time. Prepare for military missions in the robotics labs, with a series of virtual cities made to 1/35th scale. Looks like fun, doesn’t it? You have high rises over there, roads, jails, bazaars, vehicles. Our robotics team made a scaled-down van with a tiny camera on the front, so a trainee can drive a mission through a variety of scenarios. Even at this size, a physical model is better at simulating a real situation than a virtual model because there’s potential for actual destruction. Something is perceived to be at risk, so people make more realistic decisions than they would in game-like simulators. Use mannequins to learn how to provide the best health care possible. We have a team developing models for health care partners. This mannequin responds to touch and has the capability for changing skin tones to show a rash, have a fever and display appropriate facial expressions and responses. All to simulate real medical scenarios. How it’s used has the potential to take healthcare training to another level. Military and business leaders partner with us, on site. So our graduate students are essentially getting the best kind of internships imaginable — a natural transition into a career. For example, our graduate students have gone on to work for Google, Microsoft, Qualcomm and the U.S. government. Learn to fly using VR. You’ve seen flight simulators, but we created this one differently. You can use the goggles to see and communicate with an avatar who simulates a flight instructor. So instead of pilots going to an expensive facility for their early training, they can use this. Train top-level firefighters using simulations on large wraparound simulation screens. You can create dozens of fire situations for training-incident commanders. In here you can simulate a fire in a big-box store or a hotel or a forest or a home. Within each simulation are cues that the firefighter needs to recognize to make critical decisions. There might be toys in the yard, a car in the driveway, a propane tank nearby, a certain kind of smoke. The trainee has to make fast and accurate decisions, getting experience in weeks that would otherwise take years in real fires.